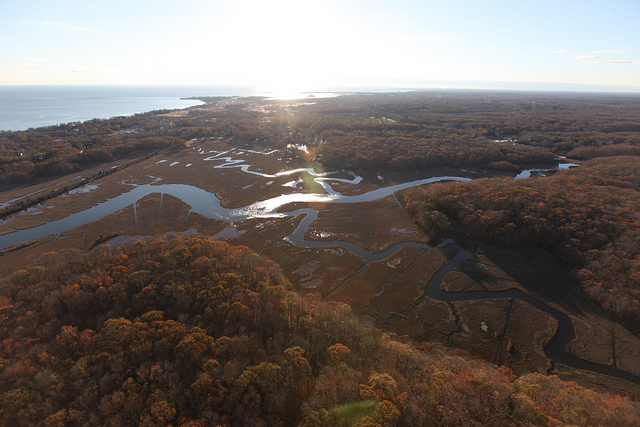 Republicans stripped away important coastal restoration money and screwed a small nature preserve in Connecticut for no reason. After much haggling with conservatives, the Senate finally passed a bill on Monday that provided $50.7 billion in relief to people affected by Hurricane Sandy. President Obama signed it late Tuesday. That’s certainly a good thing—but along the way, the bill got roughed up a little bit in a couple ways that have irritated environmental groups. The first was a $150 million cut in the amount of money that was originally headed to the National Oceanic and Atmospheric Administration. That agency was going to use the money for coastal reconstruction and land acquisition by granting it to Regional Ocean Partnerships, which are multi-state coalitions formed to better manage ocean coasts that touch many different states. But Regional Ocean Partnerships are an integral part of Obama’s National Ocean Policy, which he created in 2010—much to the dismay of Congressional Republicans and the oil companies who fund them. They hate the policy because, among other reasons, it creates substantial obstacles to offshore oil drilling. Republicans have repeatedly passed amendments barring any money from going to National Ocean Policy implementation, and when House Republicans saw $150 million going to the Regional Ocean Partnerships in the Sandy relief bill, they axed it—even though it only would have gone to coastline restoration. The money was not restored in the final Senate version, and so NOAA has virtually no money to restore sand dunes, coastal wetlands and other areas damaged by Superstorm Sandy. House Republicans—specifically, Representative Rob Bishop—also added another provision that could hamstring federal efforts to restore damaged coastline. The Bishop amendment to the Sandy relief bill, which remained in the Senate version, prohibits the federal government from using any of the money to acquire new land. Bishop supposedly feared a covert federal land grab, but in reality any land acquisition would only be allowed in areas affected by Sandy—just like every other provision in the bill, language specifically limited the funds to that use. And land purchases would simply be used to restore space to areas that suffered irreparable storm damage, and also add additional buffer zones for future storms. Another provision added to the bill is nakedly punitive—a simple “screw you” to residents of Connecticut. It was ravished by Sandy and sustained what its manager termed “severe” damage. In the original Sandy relief bill put forward by the White House, the McKinney refuge was slated to receive $9.8 million to fix the damage—a vanishing fraction of the entire $50 billion legislation. The provisions under this heading in title V of this division shall be applied by substituting ‘$78,000,000 (reduced by $9,800,000)’ for ‘$49,875,000’: Provided, That none of the funds made available under such heading in title V may be used to repair seawalls or buildings on islands in the Stewart B. McKinney National Wildlife Refuge. Yes, the legislation specifically took away that $9.8 million and singled out the McKinney refuge as ineligible for restoration. Why? Because a Republican representative of Louisiana, John Fleming, made the McKinney nature preserve a symbol of supposedly wasteful pork spending in the relief bill. “For Heaven’s sake we should not be spending money restoring coastlines on islands that nobody ever goes to,” he crowed on the House floor during the debate earlier this month. (Over 17,000 people visit the McKinney refuge each year, and visitors are sort of besides the point to a wildlife refuge anyhow). But to appease the talking point, House Republicans passed Fleming’s amendment to specifically keep the McKinney refuge from getting any money. Officials now say it will be hard for them to repair the damage and protect the land. Besides coastal restoration, House Republicans also will likely block meaningful immigration reform.